Burgeoning Wolverine Star: What did you expect? After Michigan needed overtime to be a bottom of the barrel Iowa team last Tuesday, some people decided that the massive amount of evidence supporting the idea that Michigan is a bad basketball team with no hope for the future should be thrown out because, well, they kept fighting and maybe the can shoot. Moral victories and coaching/playing for pride, hard fought, etc. And then they lost to last place in the Big Ten Penn State. At which point, I need to once again say: This is a bad basketball team with no hope for the next two years. For much of this season, Michigan has been poorly coached, outmatched on the floor, and downright bad. They can't shoot, and there's little evidence pointing to the fact that they'll be better next year. They are losing their most consistent scorer--top scorer in Big Ten play, to boot--as well as the only other center on the roster. There's a chance their most prolific scorer will leave the team early for the NBA. And the coach who inspired so much hope last season, bringing Michigan to the NCAA Tournament for the first time in a decade, has shown a complete regression on all fronts and looks hapless to figure things out. With a middling recruiting class coming in next year and a coach who historically hasn't been able to recruit on the level of the national elite, the Michigan program looks to be headed in the complete wrong direction. Anything but pessimism for this team is entirely misguided. It's a shame, too, because during the first half of the Penn State game, and one of the first times all season, Michigan's offense finally looked complex. There was movement on the floor, back screens, flashes to the basket, and hell, even Novak and Douglass started driving into the lane--Beilein clearly had been working on this in practice, and the team looked competent. Manny Harris played from both sides of the floor instead of just standing as a fixture on the left shoulder, and consequently had one of his better games of the season. And yet, in the end, the team shot 6-28 from three-point range (four of those makes by Harris who, again, is about 50/50 to leave the team at the end of the year) and proved to be completely inept on offense. How do you build a three-point shooting team around players that can't hit three pointers? 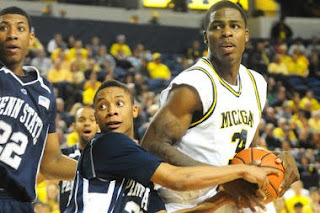 Who has Beilein brought in that can contribute? This program is in serious trouble.